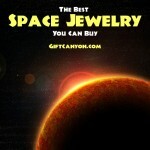 Steampunk jewelry is great mix of the industrial revolution and the Victorian era with a dash of the future. We often see skeleton keys, gears that bears the concept of time and industry as the main theme of the steampunk genre. 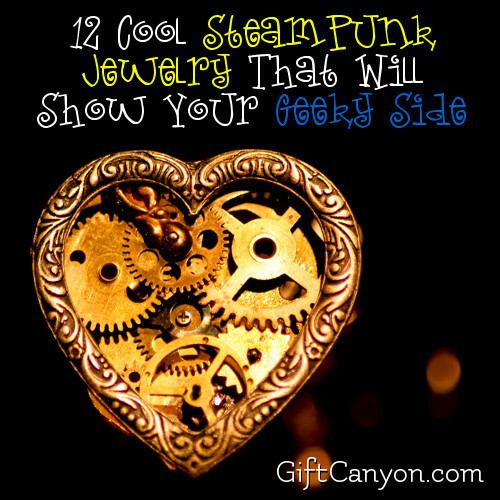 Well, if you are into this kind of fashion sense, we are pleased to inform you that we have picked the top steampunk jewelries that will make you look energy filled and would feel like a walking piece of art at the same time through these great finds! 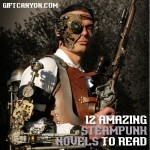 Check out our top twelve steampunk jewelry from our prepared list below for your eyes only! You may seem lost and weary but maybe you can have some sense of direction once you get to wear this steampunk compass necklace. 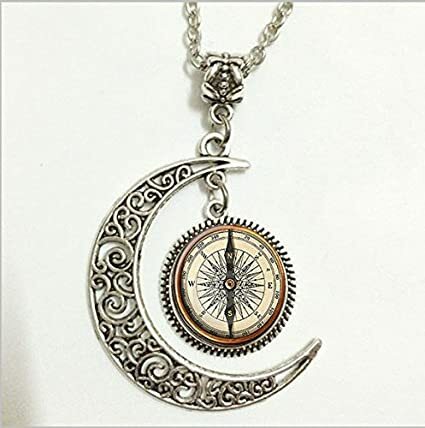 This elegant looking necklace has a distinguished steampunk themed pendant that shows a compass with a quarter moon. This necklace is made from alloy with a 24 inch long chain. The pendant runs for up to 16mm which makes it just right to rest on the chest. Can be worn in any casual event or even during a cocktail party for it may bring out a different kind of vibe when you put it on. 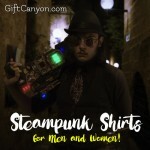 Whenever we say steampunk, we usually have gears on mind. So, if you are looking for some gears as a piece of jewelry that could rest on the chest for some intriguing look then the steampunk gear necklace would be most suitable. 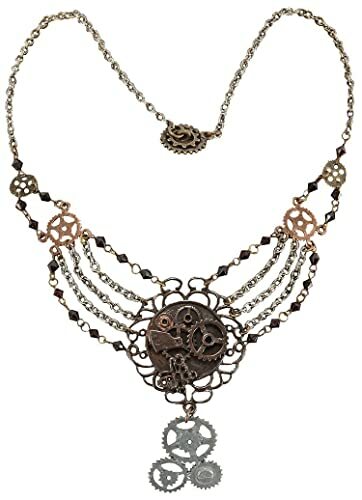 Check out this dramatic looking necklace that is mostly decorated by steampunk gears that is relative to time travelling themes that we usually see in the movies and some sci-fi shows. This necklace runs for up to 7.5 inches and would be perfect to wrap around that gorgeous neck. Owls are interesting and fun to look at not only because of their huge eyes and staring look but it also brings some kind of wonder to the observer for some reasons. 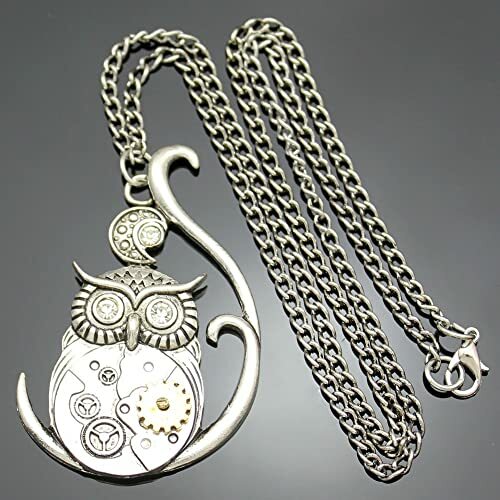 Owls can also be mixed with steampunk mix through this vintage ornate necklace. This necklace is a fusion of mystery and elegance which brings the wearer a gorgeous look at any time of the day. The multi gears on the owl makes it look so mystical and for sure whenever worn, this piece of jewelry would be a conversation starter and attention magnet to the wearer. The necklace chain runs up to 22 inches while the pendant measures up to 6cm which makes this necklace look charming and just right for any occasion. Cocktail parties call for some vintage look. The long body contouring cocktail dress calls for a daring choker to match. 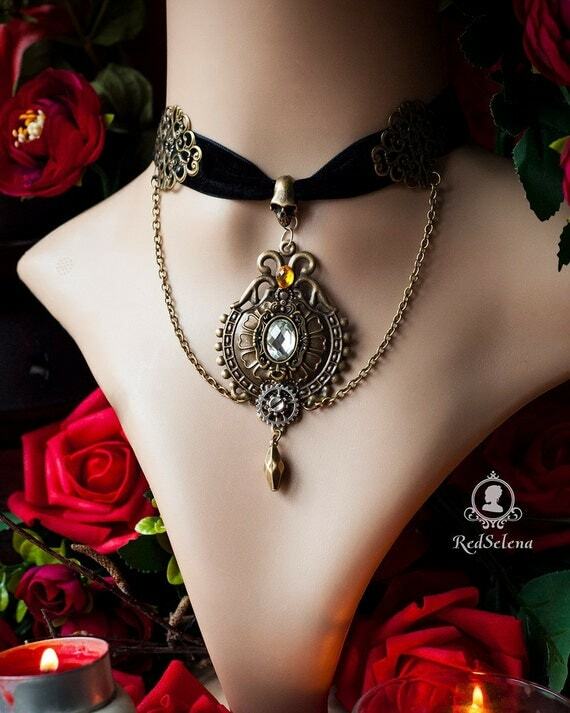 This steampunk choker would do your dress some justice and would make you look more dazzling as ever. 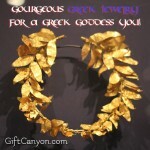 This choker is a mix of velvet and bronze would certainly give you a royalty feel that you always wanted. This necklace is up to 28 cm in length while the pendant is 2cm in length. 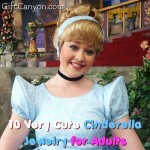 It also has a dashing rhinestone that gives that additional vintage feel to the wearer. A cat lover would always be wowed at the sight of seeing this adorable fur creature. If you are looking for a steampunk jewelry with a mix of your favorite fur buddy then this steampunk cat necklace is the right one for you! This steampunk cat necklace comes in different colors and sizes to choose from. This gorgeous jewelry would give you the fabulous feeling of being a fashionable creature while adding some spice of the animal that you love the most. This steampunk cat necklace can run as long as 24 inches. Earrings are meant to give the ears some justice and to make the wearer even look more dashing as ever. Adding some steampunk feel to the earrings give you a different kind of look that is eye catchy and make the observer amazed. 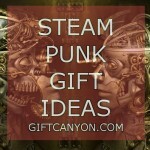 See our top favorites of steampunk earrings from the list below for your reference. Whenever you have some impressive ideas in mind, we are like what we see in the animated cartoons and feels like there are some light bulbs that pops right out. 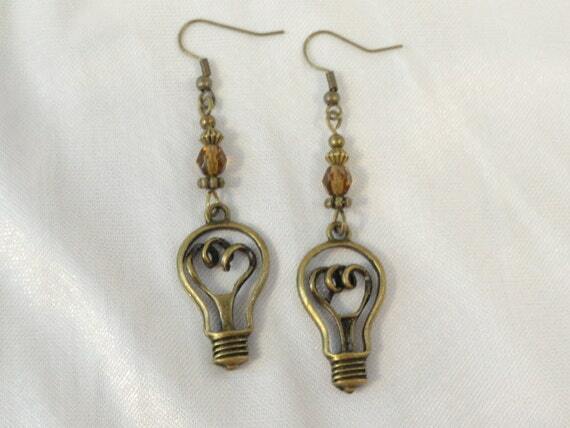 A brainy person deserve some interesting steampunk jewelry that signifies their great ideas such as this pair of Edison light bulb earrings. This steampunk Edison light bulb earrings is so unique and rustic looking that it gives a feeling of steampunk whenever worn. This dangling pair of earrings would give the wearer a brainy look. This earrings is a mix of glass, brass and metal that would be perfect for any occasion it may entail. Gears are major symbols of the steampunk genre. Just like these gears, you can also achieve some rustic industrial feel just like what we see in some machines. 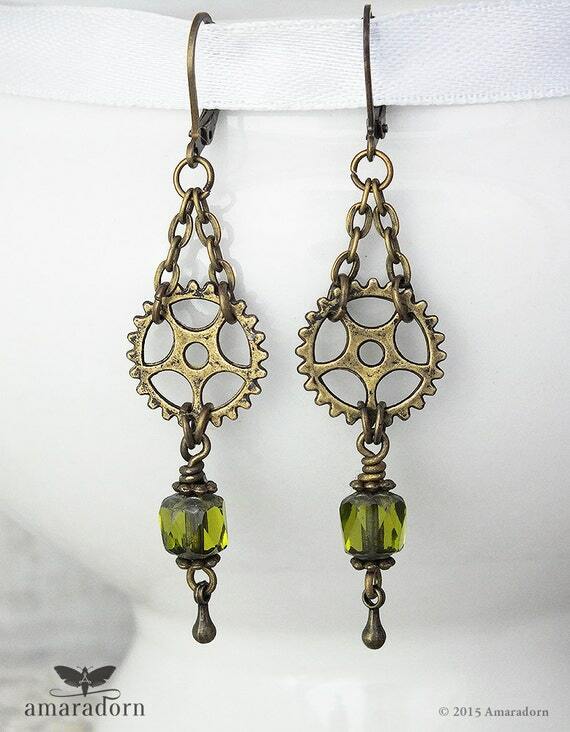 This pair of grungy gears earrings is a mix if Czech glass, bronze finish cogs, beads and a bronze chain with rhinestones. This pair of grungy gears can be worn in casual wear and even in semi-formal events. This pair of steampunk jewelry is just perfect! Just like the time traveler’s pocket watch, this pair of steampunk pocket watch gears would give you the speculative fiction genre feeling while worn. This pair of earrings comes in fish hook design that can easily be worn at anytime and anywhere. 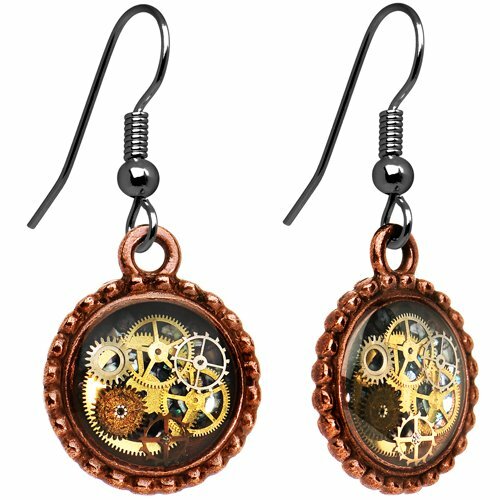 This steampunk pocket watch gears earrings runs for up to one and half inch long. We all have different tastes when it comes to fashion. Some of us wants some over the top designs such as this steampunk fae elf earrings. 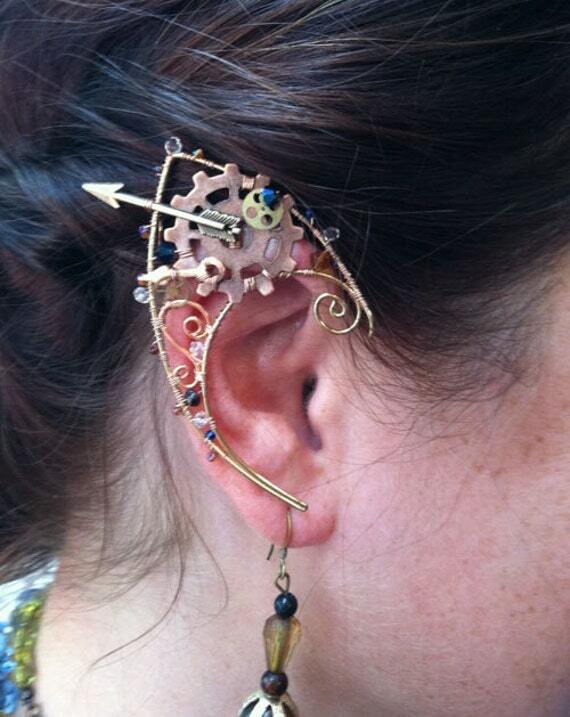 This steampunk fashion jewelry is an ear wrap which is made from Swarovski crystals and watch gears. This steampunk fae elf ears are easy to wear and can be worn comfortably at any occasion it may entail. 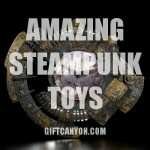 Cute and offbeat, this steampunk accessory is perfect for the person who loves odd accessories. Skeleton keys symbolizes steampunk theme. 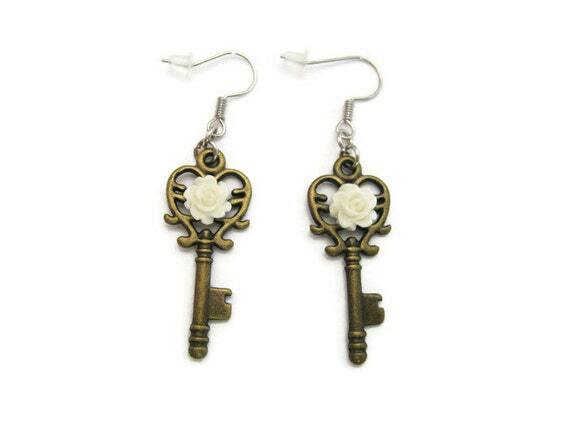 This key rose earrings is made from stainless steel that is nickel free. To make these earrings more beautiful it comes with some roses attached. This pair of key rose earrings is over and inch long that can easily be clipped on. 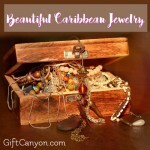 Bracelets and cuffs are iconic jewelries that can be worn to accentuate your wardrobe. The steampunk jewelry gives an industrial feeling with a mix of Victorian era. 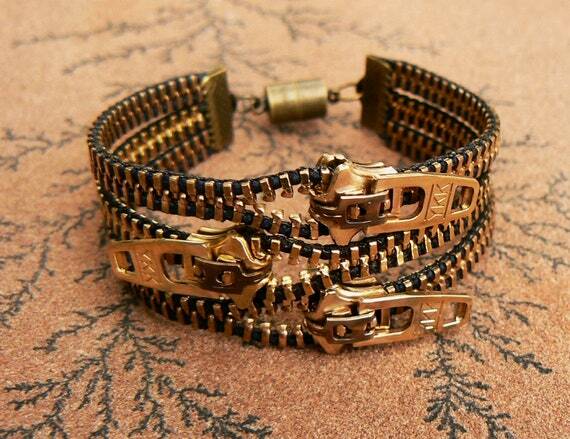 Check out our great finds of steampunk bracelets below. If you want some rugged feeling to go along with your metallic look then this steampunk zipper cuff would be a charming accentuate to your look. This steampunk zipper cuff is a simple fusion of three metallic zippers that would certainly give you a steampunk glow to your get up. This steampunk bracelet comes in different sizes to choose from and you can also get to choose from a magnetic clasp or a claw clasp as the lock. This steampunk wrist cuff bracelet is a jaw dropper. This one of a kind bracelet gives the wearer a gorgeous look that would certainly be a show stopper at any time. 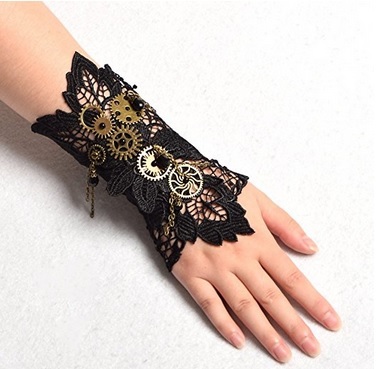 This steampunk wrist cuff bracelet is made from a Victorian wristband with lace and extender. This bracelet is up to 18cm and can be extended for 7 cm more. This would be a perfect accentuate to your cocktail dress or any evening gown it may be. This can also be worn in semi-formal event even in casual wear as you please to add some steampunk genre to your wardrobe.